by Judy Elliott Archives - Art Matters! Silk artist Judy Elliott will be the featured artist at Gallery One in Grants Pass and will demonstrate her process for painting on silk on First Friday, July 7th, from 6-7pm. Judy Elliott’s artwork relates to traditional painting. However, instead of painting on canvas, she uses dye and resist on silk, with an emphasis on wildlife and its preservation. Watch a demonstration of her work on July 7th, 6-7pm at Gallery One in Grants Pass. “My inspiration for painting on silk is influenced by my experience while growing up in Hawaii with a family who appreciated art, music, exotic cultures and a love of nature, as well as my observations while hiking throughout Oregon. After reading countless articles about the perils of nature and it’s wildlife, I chose to express the urgency of man’s awareness and accountability for his role in this degradation. My work attempts to reflect this. My work relates to traditional painting; instead of paint on canvas, I use dye and resist on silk. As I developed my imagery, I created my own technique as a pictorial expression. Usually, I focus on a particular area with endangered species as a subject matter, as in the ocean and its sea life, rivers and streams with wild birds and fish, Hawaiian wildlife or bees with wildflowers. Judy, a Grants Pass artist and SOAR member who creates handpainted silk art, has found a new focus in the subjects of her work over the past two years. Having grown up in Hawaii with a father who not only helped develop her eye for design and color but encouraged a healthy lifestyle with respect for Nature, she has been creating activist art works with subjects as diverse as endangered marine life and native Oregon wildflowers with bees. Pictured above are a few of her new works, including pieces from her Save Our Oceans and Save Our Bees collections. Please plan to attend one or more of the following events to view her silk art pieces, handpainted scarves, greeting cards, and handmade kimonos. On First Friday, May 1st, beginning at 6:00pm Judy Elliott will demonstrate hand-painting silk, using dye. Her paintings are a reflection of her love of nature in all forms, with an emphasis on its protection. Her paintings can be viewed at the gallery, Tuesday through Friday from 10am – 5pm, and on Saturday from 11am – 5pm. During the months of April and May, Judy Elliott will have a display of her silk paintings showing Oregon wildflowers, insects and birds. Hand-made greeting cards are available as well. You can visit the gallery Tuesday through Saturday, from 11am – 5pm. Beginning May 1st through 31st, Judy Elliott will have her hand-painted silk wall hangings on display, depicting Hawaiian flowers, birds and papayas! You can visit the coffee shop Monday through Friday 8:30 – 5, Saturday 9 – 5 and Sunday 10 – 5. 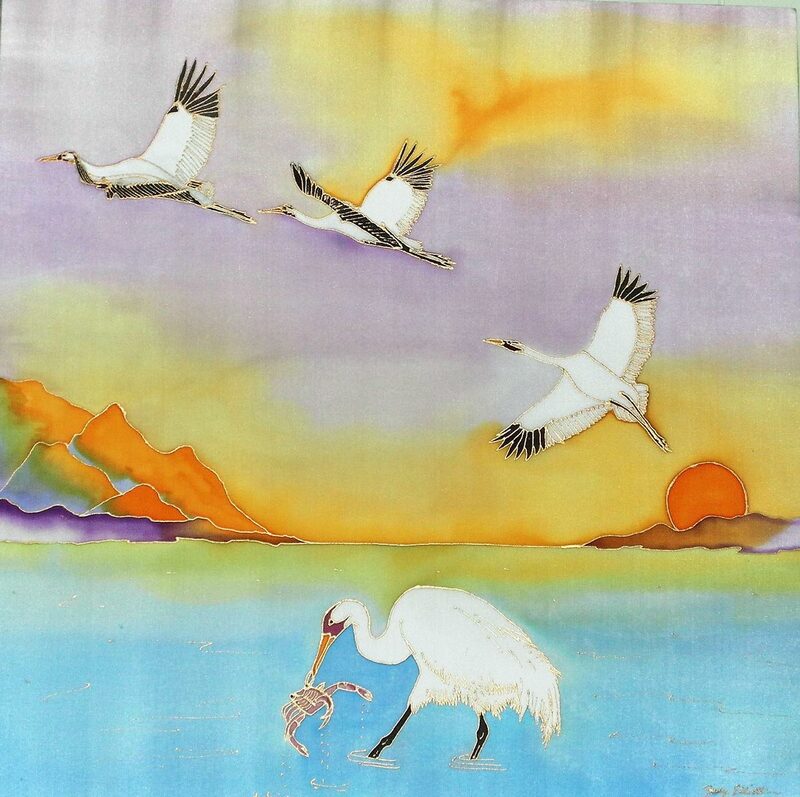 From May 13th through August 7th, Judy Elliott will have her hand-painted silk wall hangings on display, with the theme of “Inspired by Nature.” Her emphasis will be on protecting our rivers and streams, and will feature Oregon birds and salmon. The gallery’s hours are Tuesday through Saturday, from 10am – 4pm. There will be a special reception on Sunday, May 17th, from 2 – 4pm, with a music, wine, food and $5.00 admission fee. Two Day Silk Painting Workshop in Art Presence’ New Classroom this July! Silk Painting Class offered (Two Sessions) – Wednesday July 2nd & 9th from 9am – 1pm each at the Art Presence Upstairs Workshop, 206 North Fifth St. in Jacksonville. The cost is $65 per person, including supplies. Each person registering must be at least 14 years of age. Please bring a simple drawing of your own choice to class, keeping in mind that it should fit on an 8” wide X 52” long scarf. She will need a minimum of at least 10 registered participants. Judy will be demonstrating silk painting at The Taste of Summer festival on Saturday, June 7 from 12 – 4pm. You can view her work at her website Dragonfly Designs West, her Etsy site, and on Facebook. To register, send an email to [email protected], or call Judy Elliott at 541-291-2121. You can also register at Art Presence Art Center any Friday – Sunday from 11am – 5pm. Judy Elliott, the talented Grants Pass silk artist behind Dragonfly Designs West, responded to Art Presence Art Center‘s call for member art in May 2014’s “The Sea, the Ocean” theme with a new series of gorgeous handpainted silk wall art depicting endangered marine life. We’ve watched her work undergo several evolutions over that past few years, and this could be the most detailed and artistic work we’ve seen from her yet! Elliott, a native of Hawaii, is a natural to step forward as a voice for the world’s oceans. Growing up with many of the species of marine life she has showcased in her paintings, she has witnessed the ocean’s decline in her lifetime. This series of paintings reflects her deep concerns about the pollution contributing to loss of habitat and other life threatening issues arising primarily from the vast amount of plastic refuse found all the way into the ocean’s deepest canyons. Judy is also showing more new silk paintings from her studio, including traditionally rendered Japanese cranes, koi pond scenes and moths…and as always, dragonflies. Stop in to view these beautiful pieces and more outstanding works by Art Presence member artists in person any Friday, Saturday or Sunday from 11am – 5pm through the month of May. There will be a reception for the artists on May 9 from 5-7pm. Examples of debris found littering the ocean floor. Litter from modern civilization has become so pervasive that scientists conducting the first comprehensive study of its undersea distribution couldn’t find any place they looked, including in some of the deepest oceans, where it didn’t exist. Using video from underwater drones and samples dredged off the seabed, researchers from 16 European organizations say they found rubbish everywhere from the Mediterranean to the mid-Atlantic ridge, about 1,250 miles from land. They found that plastic was the most common type of litter found, with items associated with fishing coming in second. But an extensive distribution of glass, metal, wood, paper and cardboard was also observed. Writing in the journal PLoS ONE, the researchers said the most dense accumulations of litter were found in deep underwater canyons. “Submarine canyons form the main connection between shallow coastal waters and the deep sea,” said mapping team leader Veerle Huvenne. “Canyons that are located close to major coastal towns and cities … can funnel litter straight to water depths of 4,500 meters (14,800 feet) or more,” he added. He added that the accumulation of marine litter is now a worldwide problem. Hi everyone! I’ve been very busy getting the word out about my new displays at various galleries in southern Oregon. Come to see my recent works! May 2-June 1 Art Presence Art Center in Jacksonville: Seashore and ocean themed paintings on silk, with an emphasis on preservation of endangered marine life. May 1 – 31 Gallery One in Grants Pass: display of paintings on silk of egrets, cranes, blue heron and dragonflies, luna moths and butterflies. 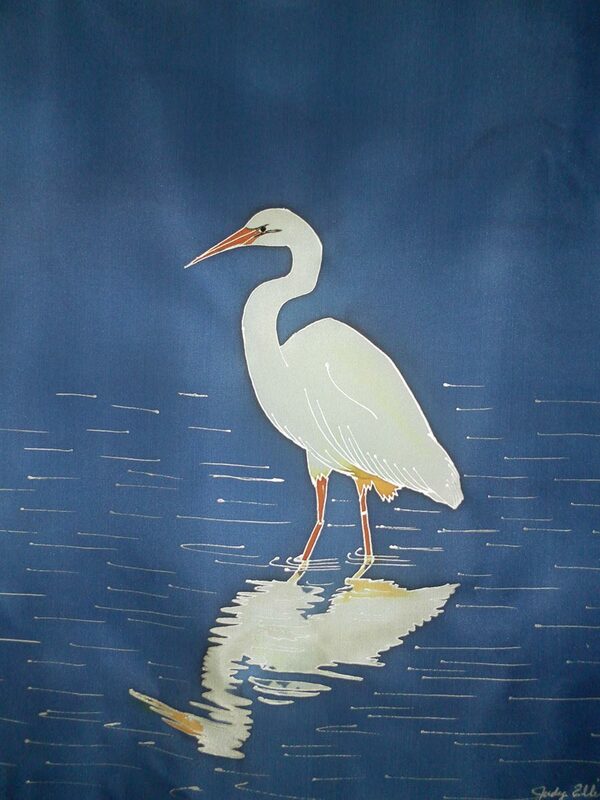 I will be the featured artist for June 2014, when I will be displaying my hand-painted silk jackets! June 1 – August 31 Southern Oregon Guild in Kerby: “Wild Blue Yonder” with an emphasis on the ocean. April 11 – July 11 Thomas Lee Gallery in Ashland: Display of hand-painted silk scarves and wall hangings. August 2014 Artist Alley in Brookings: I will be the featured artist for August! GoodBean Coffee, Jacksonville: Solo show of silk wall hangings during the month of October and an “Angel” silk wall hanging in a group show during the month of December. View all Judy Elliott's posts. About the author: "Growing up in Hawaii, I absorbed the tastes and cultures of the Islands. My father, a photographer, also blessed me with an artistic eye for exotic colors and shapes. In 1991 I came to Oregon; my unique handsewn cotton Japanese and Hawaiian print Happi Coats and Kimonos, hand-painted silk scarves and wall hangings can be found at select art venues throughout the state. I'm often commissioned to create custom pieces to wear or to decorate the home or office." Learn more about Judy's work - visit her listing at SOAR to explore all her web links and find contact information. Wine, Dine and Shop for holiday gift items! I will be there to display and sell my hand-sewn, cotton happi coats and kimonos, hand-painted silk wall hangings and scarves at Voorhies Mansion / Edenvale Vinery, to benefit HOPE Equestrian Center, a Medford therapeutic horsebackriding program for the disabled. The Southern Oregon Guild is also having a Holiday Gift Show on Sunday, December 1st, from 2pm – 5pm. Start your Holiday Season with the Southern Oregon Guilds’ Artists and the Oregon Little Big Band! We’re having a fabulous party to introduce our 2013 Holiday Gift Show and give you the “Art Alternative” for your Holiday season! We’ll be serving tastings of festive holiday wines and a wonderful buffet. Free drawing for a hand-painted garden chair! The Fall Season is about to begin, and I am excited to share my new line of silk scarves and wall hangings, as well as my new cotton printed Happi Coats and Kimonos! It was fun participating in the recent Art Presence showing and sale in Jacksonville, and I have many events planned to follow. My next and upcoming event is the Jacksonville Celebrates the Arts, which will be held right on Labor Day Weekend. This will be the second time that I’ve participated in this event, with the added interest of the silk scarves and wall hangings. I am also going to participate for the first time in Kerby, at the Artoberfest showing and sale in October. I am going to have a demonstration of my silk painting as well. These events are listed on my website, with a maps, times and dates. Hope to see you there!